Max realise that he ran away from the wrong woman the other night. Eileen invites herself to move in with Des. Paul has given Scott a poster for a Chinese night at the Coffee Shop. He grabs his coolie hat and races off! Terry comes round with some designs for her wedding dress - she did them herself. Julie doesn't really like them and rudely says this out loud! Paul tells her off. Julie walks off. Lucy tells Terry she could wait a few years and she'd be her bridesmaid! 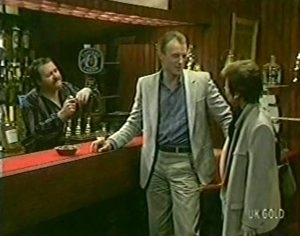 Terry and Paul ask Des if it's OK that they're still getting married in light of his break-up with Joan. Des says it's fine. Des comes round to see Daphne, who's in her nightdress and dressing gown. 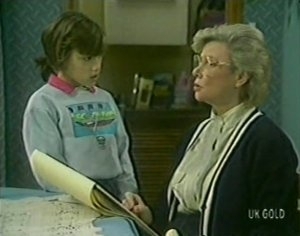 He tells her about Eileen moving back in and Daphne's shocked. Des says he needs a plan and asks Daphne for ideas. 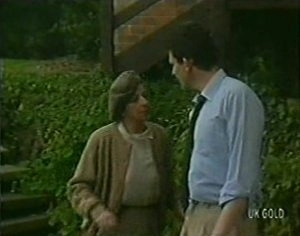 She tells him he's on his own - he has to learn to handle Eileen himself. Des says he really loves Eileen, but - from a distance! 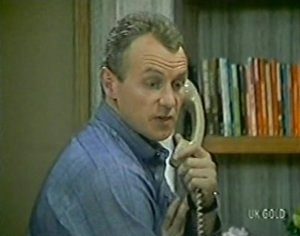 Des suggests that Daphne comes back and lives with him, but Daphne says no - she's got someone living with her. He assumes it's a bloke! but Daphne explains about Rachel - she can't let her down. Des says he'll reserve Daphne's room for her, but Daphne isn't having any of it. Jim rings Amy Medway's number. She comes to the phone and they chat about Max. Jim explains about the botched meet-up between her and Max. Jim invites her out to lunch with him! The old dog! Scott is sad that Jim has a date. (Why? He didn't mind Anna). Danny tells him to get used to it. Apparently Jim, Max and Amy were all in school together. Danny says he could introduce Amy to Richard Morrison and hope they go off together! Jim is waiting for Amy. (Is there no other meeting place in Melbourne?!) Amy arrives and they recognise each other straight away. Jim puts his arm around her(!) and introduces her to the barman. They sit down to reminisce. Amy says all they need is Max and it'll be just like old times! Amy tells Jim that she's about to get divorced. She lives in England now, she's heading back in a few days. Paul and Terry have found a small, reasonably-priced house. They talk excitedly about renovating it. Danny is trying to teach Scott to play the guitar. Lucy asks Helen if Jim has got a girlfriend. Julie comes in and grimaces at the guitar "music". Then Jim comes in with Amy and Helen recognises her straight away. Everyone is getting on very well. Amy asks after Rosemary and Jim gets out the family album. It has some ancient photos of Anne and Amy in. Jim and Amy head off - Jim says he wants to spend some time alone with her. The man has no shame!! When they've gone, Scott and Helen looks at the wedding list. Helen isn't pleased to see Aunt Gwen on the list. She tells Julie off - she made it clear that Gwen was not to be invited. Julie says she thinks that Helen is being silly. Helen says she doesn't have to give a reason - she doesn't want her there. Julie says that Paul wants her there, and it's his wedding. HELEN: Now let me tell you this. If that woman comes to the wedding, I walk out of this house.